FULL THROTTLE is not your ordinary sport-fisherman. 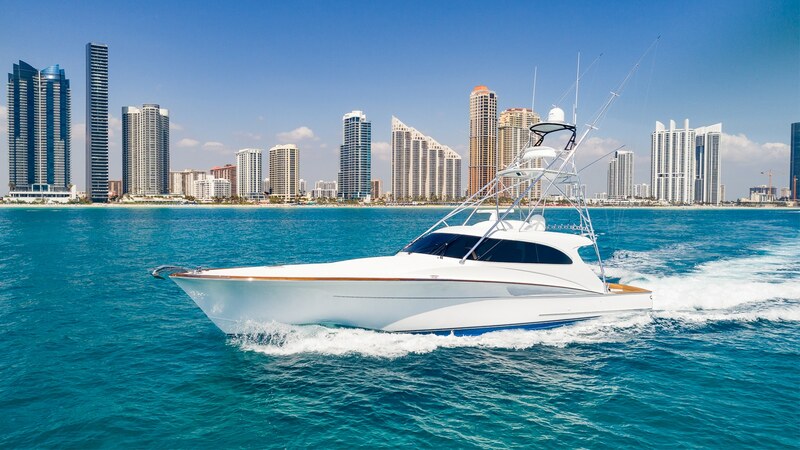 The sleek hard-top express has a top speed of over 50 knots and can keep pace with even the fastest center consoles all while maintaining excellent sea keeping with her variable dead rise hull. Unique features that are both practical and simple compliment a beautiful interior salon that has power windows aft. Every nook has a clever storage solution for extended fishing trips and cruising. A beautiful aluminum Palm Beach 6’ gap tower that makes the boat look even faster. The teak toe rail and transom are accented by a wraparound mask that highlight the sleek F&S lines. The variable dead rise hull will flat out get up and eat any rough sea, fish hard, and keep you dry. Complimented with a Seakeeper M8000 and MTU 2,650 HP motors the engine room is laid out with maintenance in mind. Everything is easily accessible through a door in the center of the cockpit. FULL THROTTLE pushed the envelope with her design and it was executed to perfection.